Guess who was recognized as a lawyer who “leads by example” by the New York Law Journal on September 19th? Jim Walden, of course, channeling Howard Beale. It is difficult to right a wrong inflicted by the government, said Mr. Walden. “Before I take a case I evaluate whether the client will get vindication without intense negotiation or litigation,” he said. The piece says that “Mr. 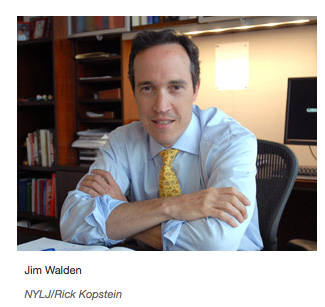 Walden so far this year has devoted at least 800 hours to pro bono.” I wonder how many of them were for Iris Weinshall.